As part of my ongoing quest to make everything on my plate I recently started to make my own pickled cucumbers. We had been given a huge bag of organic cucumbers, maybe 2 or 3 kilos, and it was about 30 degrees outside so I needed to move quickly to preserve them or they would wither & be wasted. 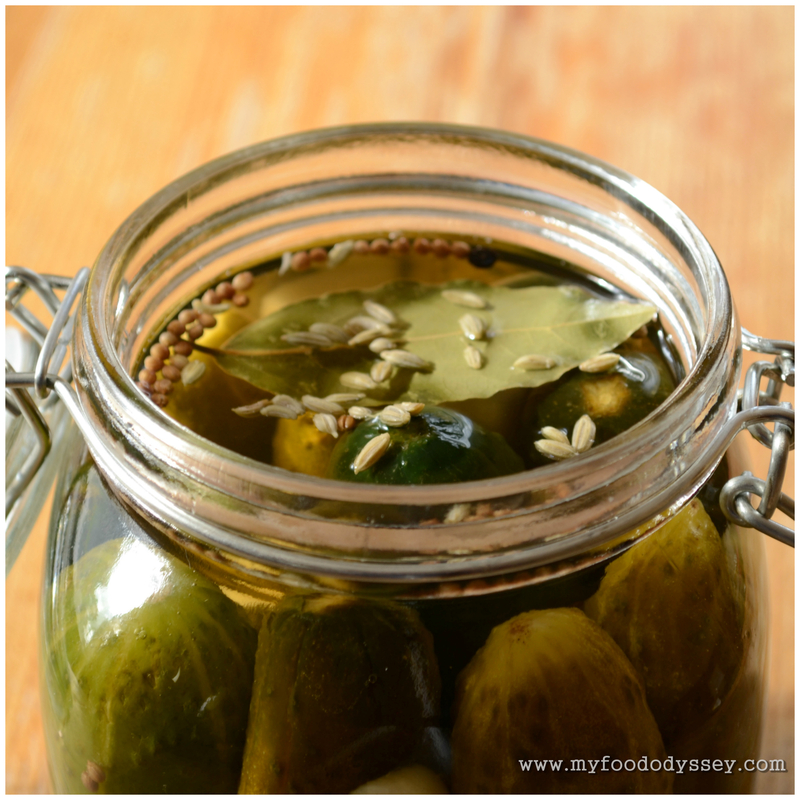 I had never made pickles so I did a quick search for recipe ideas, then threw together a quick brine & hoped for the best. The result was only short of miraculous. In just 24 hours I had a crisp and tart pickle, crunchy and delicious with just the right amount of salt. The first batch was devoured within one day and I set about making a second batch. Because of the speed with which they were disappearing, and because cucumbers seemed to keep arriving at the door, I made batch after batch over the following weeks, enabling me to tweak and perfect my recipe. 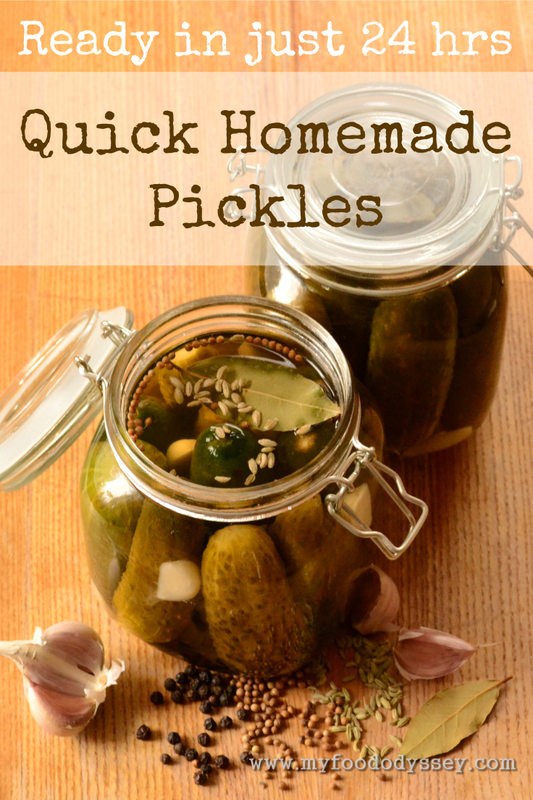 These are quick pickles that don’t require any cooking or specialist canning equipment. They are simply made in the jar. 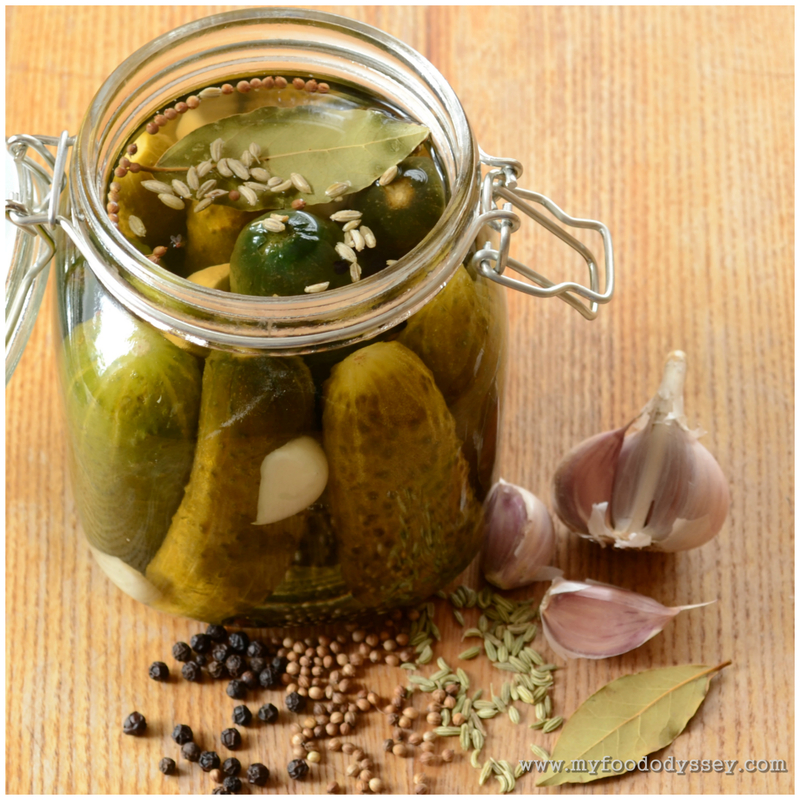 The fermentation does increase the shelf life of the cucumbers a little, but these are not long-life pickles – they need to be kept in the fridge and consumed within 3-4 weeks. Pickles are incredibly versatile. Use them as a topping in homemade burgers, as an ingredient in cold beet soup or to make a tangy tartar sauce for your favourite fish & chips. We serve them as a crunchy garnish on the side of just about everything, from grilled meats to fried eggs. The acidic bite and salty taste mean that very little other seasoning is needed on the plate. The essential ingredients in this recipe are the cucumbers, water, vinegar & salt. Anything after that is a bonus and can be adjusted to suit your own taste. My mix gives a hint of garlic flavour without overpowering and the spices are fragrant but subtle. However, if you don’t like garlic just leave it out. If you don’t have this mix of spices just use whatever you have to hand. Mustard seeds would work well. 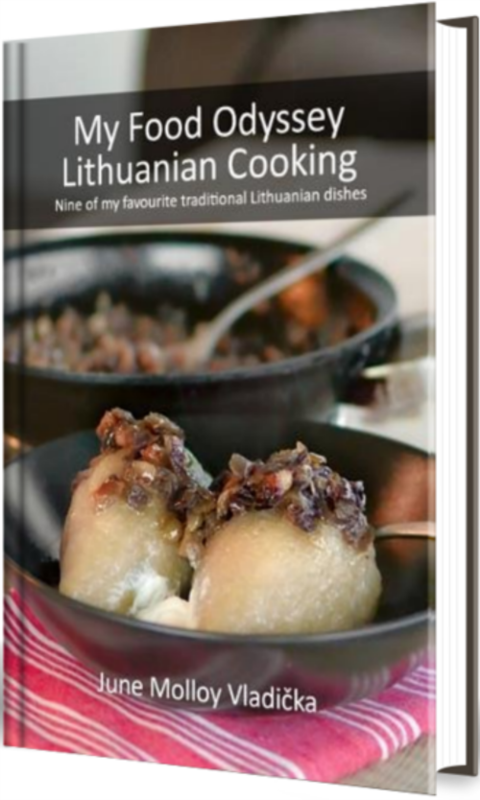 Caraway seeds would traditionally be used in Lithuania instead of fennel – I just happened to have fennel in my pantry. Fresh dill is also a traditional ingredient in pickles, but I’m not a fan so I never use it. Add a few chilli flakes if you like a touch of heat. My only advice would be to start with very small quantities of whatever spice you’re using – you can always add more in future batches if you like your results. Wash the cucumbers and arrange in a one-litre jar. Add the garlic, peppercorns, coriander, fennel and bay leaf to the jar. Mix the water, vinegar and salt in a separate jug, ensuring the salt is well dissolved into the mixture. Pour the liquid mixture over the cucumbers, covering them completely. Leave the jar sitting at room temperature for 24 hours. (The fermentation works better at room temperature, so don’t put them in the fridge just yet.) Your pickles will then be ready for eating. If you find the pickles are too salty for your taste you can pour off a little of the liquid and top up with water. The saltiness will reduce very quickly – within a couple of hours. Keep a note to use a little less salt in your next batch. Once fermented, the pickles will keep well in the fridge for 3-4 weeks. A slight scum may form on the top of the liquid. If so, just skim it off and the pickles will be fine. Thanks for this! My cucumbers are getting ready on the vine and there are too much for home consumption, so I will try your recipe gladly! Thanks for stopping by. Hope you enjoy the pickles! Love it, June, gonna do that for sure. I just started making Sauerkraut myself – pretty fab too! Hey Marcella! Yeh, sauerkraut is pretty fab. I haven’t made it successfully yet but I absolutely love it so I’ll have to get working on my recipe. Enjoy the pickles! Cheers Sinéad! Hope you’re well! Thanks a million! The pics did take a while and a ton got deleted, but I agree the final versions look tasty!